Everything about Nested Naturals checks out; and when we trust the company, it's easier to trust the product. Not that the natural sleep aid doesn't stand on its own: LUNA is mild, non-addictive, vegetarian, and even comes with a lifetime guarantee. What’s in Nested Naturals LUNA? What’s the Suggested Dosage of Nested Naturals LUNA? What Are the Side Effects of Nested Naturals LUNA? Does Nested Naturals LUNA Come with a Return Policy or Guarantee? How Much Does Nested Naturals LUNA Cost? Founded in 2014, Nested Naturals was originally known as IntraNaturals. The company is no veteran of the natural dietary supplement industry by any means, but what it does not have in years, it makes up for with a reputation of transparency and excellence. Nested Naturals is accredited by the Better Business Bureau (BBB) with a rating of A+. It is also partnered with non-profit organization Vitamin Angels, a charity that provides vitamins to mothers and children suffering from malnutrition in over 65 countries worldwide. Vancouver-based Nested Naturals does its sustainable product design and cruelty-free formulation in Canada, but all the supplements are made in the USA and tested to meet FDA and USP standards. One of the company’s best-selling products is its proprietary melatonin-based blend LUNA. Apart from this, there are two other products offered by Nested Naturals that may be classified as sleep aids. The formulation includes plant extracts of Chamomile, Lemon Balm, Passionflower, Hops and Valerian root; as well as amino acids like GABA and L-Theanine. It’s topped off by a mineral and a hormone: Magnesium and Melatonin, respectively. As should be done with every potential dietary supplement addition to your everyday intake, please consult a trusted healthcare professional about taking LUNA. One that is familiar with your medical needs and history is preferable! While Nested Naturals does rigorous testing on its products to ensure that they all meet FDA and USP standards, dietary supplements are not actual medication. Over-the-counter supplements are not intended to be taken as a cure or treatment for any symptoms, diseases or disorders. How Do Nested Natural LUNA’s Ingredients Help You Sleep Better? 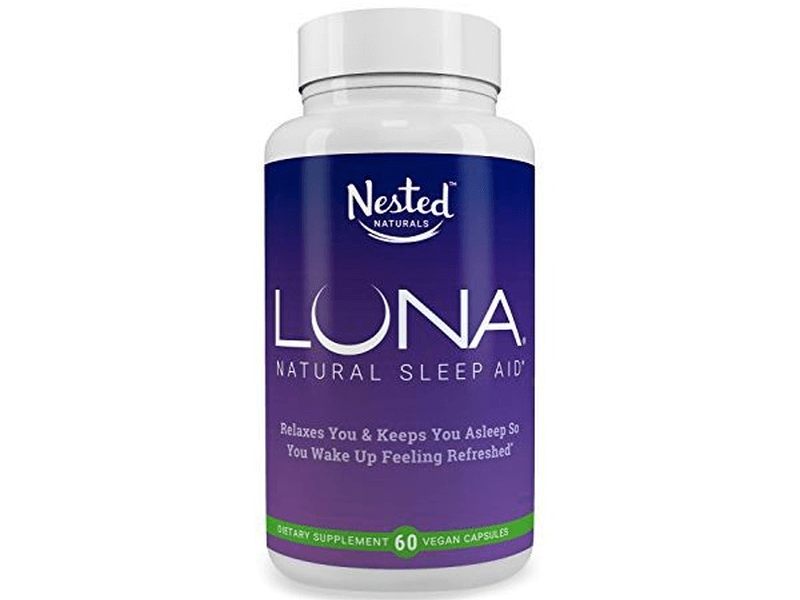 Nested Naturals LUNA was developed for people struggling with insomnia, poor sleep quality, morning grogginess, sleep pattern adjustment difficulties (including jet lag), as well as stress and tension. Its formulation encourages sleep onset, lessens nighttime disruptions, and promotes restful slumber and an energetic start to your day upon waking up. Overall, it is meant to reset and fix your sleep-wake cycle, so bedtimes will become more regular and the proper amount of hours of sleep becomes routine. Chamomile and Lemon Balm are gentle and calming herbs that are widely known for their relaxing properties. They are also commonly used in tea blends and infusions, and can also help provide a sense of familiarity. Valerian root is one of the most well-known natural sleep aids. As a sedative herb, it’s been used to centuries in several folk medicine traditions. When taken orally, Valerian root is usually combined with other plant extracts to make it more palatable and to reduce possible grogginess. Passionflower and Hops are both typically paired with Valerian root, but each has their own rich history in differing cultures as a natural sedative. In North America, where it is a native plant, Passionflower has been treated as an herbal cure-all. The three combined have even been studied as a treatment for insomnia. L-Theanine is already familiar and beloved in another form. It’s actually found in green tea! It improves brain and mood functions and is one of the most popular amino acids in the sleep supplement and nootropics markets. GABA, on the other hand, is a naturally produced amino acid used by the body as a neurotransmitter. It’s also found in certain fermented food, such as cheese or sourdough. GABA is a great amino acid for sleep health because it helps to regulate anxiety and relax the mind. Magnesium is included in the formulation, too—10 mg per dose. This is way below the Recommended Daily Allowance (RDA) of between 300 mg to 400 mg for adults, but it’s included because it’s been shown to help people sleep. Melatonin is a natural hormone so popular as a sleep aid that numerous companies sell it in many forms as a single-ingredient dietary supplement. This final ingredient is meant to encourage a healthier sleep-wake cycle, so your sleep patterns regularize and stay intact even when you are experiencing a lot of stress and disruption. Is Nested Naturals LUNA Allergy-Friendly, Vegan or Vegetarian? This natural and non-habit forming sleep supplement comes in the form of vegetable-based and vegan soft gel capsules. Unlike other easy to ingest natural sleep aids—like Vitafusion Melatonin, for example—the gelatin used in Nested Natural LUNA capsules does not come from animal bones or marrow. The formulation does not include common allergens. However, the company does encourage you to consult your physician before using Nested Naturals LUNA if you are allergy-prone, even if the sleep supplement is already considered very allergy-friendly. Nested Naturals has several other all natural sleep aid products that you can try, should you be looking for an alternative that’s milder or different in approach. For example, Nested Naturals offers a dietary supplement called 5-HTP: a simple formulation designed to increase serotonin levels, with its sole ingredient derived from African plant Griffonia simplicifolia. This may be a better option for you if the cause of your sleep troubles lies in anxiety and stress, as opposed to other factors. Also, it may be best to avoid taking LUNA is you are pregnant, nursing, or suffering from a serious medical condition. Is Vitafusion Melatonin Safe for Children? Although Nested Naturals LUNA does not need a prescription, it is definitely designed for adults. It must be noted there is a separate but similar Nested Naturals product that is meant for children: Nested Naturals LUNA Kids. This features flavored and chewable tablets, as well as a milder and simpler formulation. LUNA Kids contains no amino acids, no Magnesium, and less Melatonin—just 0.2 mg per tablet compared to 3 mg found in one Nested Naturals LUNA capsule. Here’s a pro tip: If you find that you still experience morning grogginess even with a half dose of LUNA, you may also find relief in using LUNA Kids. This may also be the sleep supplement for you if you are confirmed by a physician as sensitive to larger doses of Melatonin or Magnesium. Nested Naturals suggests a dosage of up to two capsules, and as it is a sleep aid, it is meant to be taken daily a little before bedtime. One of its purported effects is faster sleep onset, so make sure that you do not need to operate any sort of machinery or drive any kind of vehicle after you take a dose. Instead, just lie down and be still, while waiting for sleep to come. The company does not tackle this issue specifically on the official website. However, it makes a big deal out of the fact that their products are tested extensively and contain no GMO or animal-based ingredients. Thus, there is less to be worried about in terms of unexpected side effects. However, it would still be prudent to arm yourself with information and look up the active ingredients separately. You and your doctor should evaluate each element and consider contraindications and possible sensitivities based on your medical records. The company itself recommends this! Note that in rare cases even the mildest herbs, like Chamomile and Lemon Balm, can cause allergic reactions. Ingredients with more significant sedative effects—like Hops, Passionflower and Valerian Root—can affect medical readings and interact with other drugs, too. It’s best to avoid taking LUNA a few weeks before a scheduled checkup or surgery. How Effective Is Nested Naturals LUNA? We at Good Night’s Rest found the effect of Nested Naturals LUNA to be mild at best, but the numbers online look pretty good. Nested Naturals LUNA has several customer reviews up on the company’s official website, right under the purchase link. While those may be chosen specifically because they are positive, LUNA reviews on Amazon are also encouraging. Almost 5,000 reviews display an average of almost four out of five stars. What Are Common Nested Naturals LUNA Complaints? Negative reviews were mostly of the simple “it didn’t work for me” variety. A few did report vivid dreams, migraines and even increased difficulty sleeping. This may be in part due to a sensitivity to Valerian Root, as it is known to morning grogginess and uncomfortable dreams. Curiously, one of the most common complaints about dietary supplements—an unpleasant smell—was absent in all the customer reviews. In fact, some reviews noted a sweet smell, likely noting the blend of the herbal scents. Where Can You Find Nested Naturals LUNA? You can easily purchase Nested Naturals online through the brand’s own store and large retailers. Nested Naturals has its own online store, and the company even ships internationally. You can pay using a major credit card; the store lists VISA, MasterCard and American Express. Shipping isn’t free, but it is convenient; you can tack on an additional fee for USPS Priority if you’re in a hurry. You can also try Amazon, as Nested Naturals LUNA is listed there. There is no store locator on the official Nested Naturals website, so there’s no way to know except through vigorous Googling if Nested Naturals products are available in a physical store near you. Although Nested Naturals hasn’t been around long, it’s already made a name for itself as a a company that cares—about its staff, its customers, and the world in general. When it comes to product design, the company asserts that it puts people and the planet first. This means that Nested Naturals formulations are backed by research, study and evidence, on top of a firm scientific foundation. Putting out placebos isn’t the Nested Naturals style. Efficiency matters, because the health and wellness of their staff and customers matter. The healing power of natural products is not a reason to carve out a one way street, however. Nested Naturals is also adamant about being cruelty-free and environmentally conscious; sustainability and ethical production are part of the company’s standard operating procedure. Each dietary supplement under the Nested Naturals line is non-GMO and many are also vegan. What Quality Assurance Does Nested Naturals LUNA Go Through? Nested Naturals does pop-in site visits—even though quality is assured by their suppliers—as the company is obsessive about testing samples constantly. Even more tests, trials, and validations are conducted while manufacturing is ongoing. At the end of the process, all batches are sent to a third party laboratory for analysis and evaluation. Quality control and third party testing: that’s how Nested Naturals makes sure that every dietary supplement it puts out is top of the line. Quality control requires premium and pure ingredients, which in turn requires suppliers that provide them. Even when using herbs, Nested Naturals prefers standardized extracts as opposed to powdered form, because the former’s quality is easier to test. As for internal conditions, cleanliness and efficiency are paramount. All products are gluten-free and made in a NSF-certified GMP facility. While FDA standards should be a high enough bar, the company sets it higher. All Nested Naturals formulations and their ingredients comply with California Proposition 65, which is one of the strictest in setting acceptable limits of heavy metals, vitamins, and other potentially unsafe—if unregulated—materials. How Is Nested Naturals’ Customer Support? Customer Support is unparalleled. 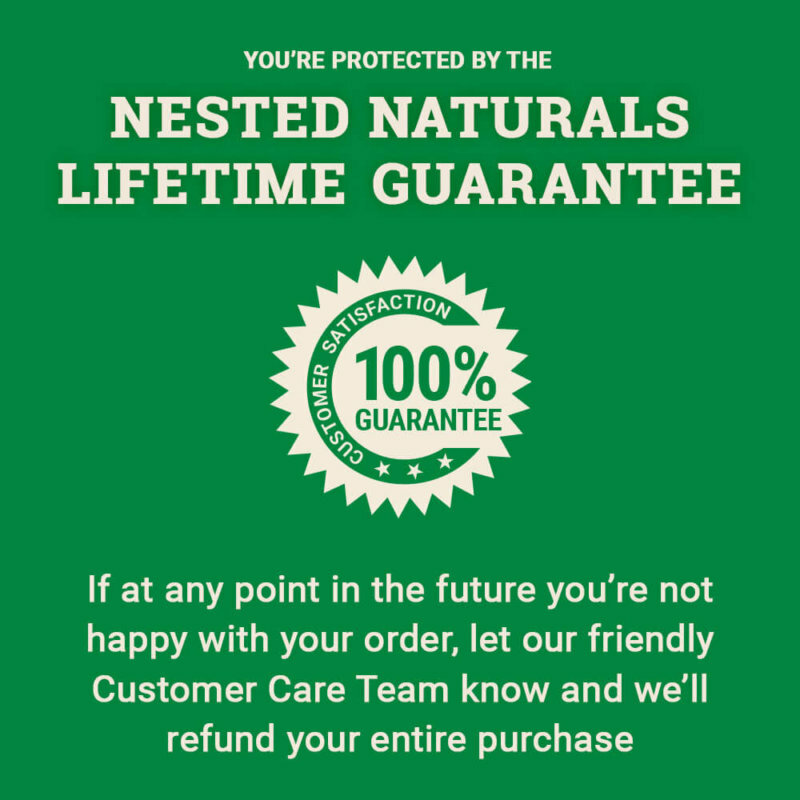 You can contact the Nested Naturals Customer Care Team through sending them an email—both a contact form on the official website and an email address are provided. You may also engage in live chat through their Facebook Page. You can even call a toll-free telephone number. The line is open 24 hours a day, seven days a week. Yes! Nested Naturals LUNA has a Lifetime Guarantee. Not happy with the purchase? Contact Customer Care and the company will refund your entire purchase. It’s that simple. There have even been cases on Amazon—yes, even though the company has its own online store to manage, its Customer Care Team interacts with Amazon customers buying their products from there, too—where the company has actually commented on negative customer reviews to remind people of the guarantee. Visit Amazon & Find Nested Naturals LUNA Deals Now! As of this writing, the sleep supplement is listed at $21.95 on both Amazon and the brand’s official online store. Nested Naturals LUNA is sold as a bottle containing 60 capsules; which is good for 15-30 days of regular use, depending on how sensitive your body is to the formulation. The Lifetime Guarantee is a pretty compelling reason to try out this product; especially since even without it, Nested Naturals Luna isn’t even all that expensive. We also greatly appreciate the brand’s social partnerships and apparent transparency when it comes to how they do business. It just feels good when you know you’re supporting a company that’s not a faceless, emotionless corporation. However, and we cannot stress this enough: Please do talk about this with a trusted healthcare professional. Self-medicating, even with dietary supplements, can be dangerous. While the effectiveness of this product—and, indeed, many other supplements—seems like the norm, there are always special cases and unforeseen interactions with preexisting medical conditions or concurrently taken drugs to worry about. Be safe; consult your doctor first.